2015 Will Continue Streak Of Shrinking U.S. Budget Deficit : The Two-Way The federal budget deficit will fall in 2015, the sixth consecutive year of decreases relative to the overall economy, according to new figures by the Congressional Budget Office. 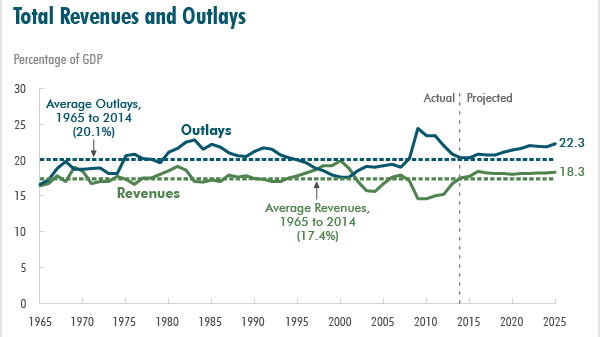 A chart shows the U.S. federal government's spending and revenues, from 1965 projected forward to 2025. The federal budget deficit will fall in 2015, the sixth consecutive year of decreases relative to the overall economy, according to new figures by the Congressional Budget Office. The office also says the U.S. economy will expand at a "solid pace" for the next few years. But as is often the case with economic news, the picture isn't completely sunny. The main problem is the overall federal debt, which the nonpartisan CBO notes is already at historically high levels when measured against the U.S. economy. "CBO expects that federal debt held by the public will amount to 74 percent of GDP at the end of this fiscal year — more than twice what it was at the end of 2007 and higher than in any year since 1950. ... By 2025, in CBO's baseline projections, federal debt rises to nearly 79 percent of GDP." As you'll recall, U.S. debt levels soared in the early years of the economic crisis as the government spent money to try to cope, even as revenues plummeted. In 2009, for instance, the budget deficit stood at 9.8 percent of the U.S. GDP; this year, it's projected to be 2.6 percent. "The aging of the population, the rising costs of health care, and the expansion in federal subsidies for health insurance that is now under way will substantially boost federal spending on Social Security and the government's major health care programs relative to GDP over the next 10 years."